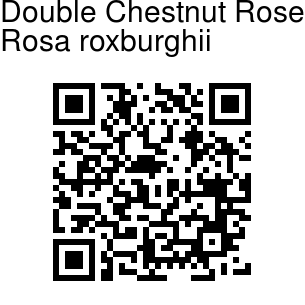 Chestnut Rose forms a mounding bush 5-7 ft high, and 4-5 ft wide, with stiff canes. 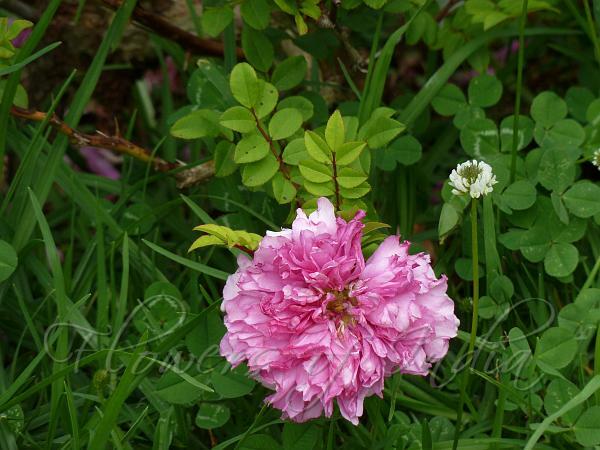 The double form of the Chestnut Rose produces slightly fragrant, very double, medium pink blooms in the spring. The calyx and hips are both covered with prickly spines that resemble the fruits of chestnut trees. The foliage is medium-green, and very small with 5-7 or up to as many as 15 evenly arranged, oval pointed leaflets on each leaf. The edges of the leaves are finely serrated, and the surfaces of the leaves are smooth. Chestnut Rose originated in China, and was introduced from the Botanic Garden at Calcutta around 1824. It is named for William Roxburgh.